Matula Tea eradicates Helicobacter Pylori from your digestive system which causes stomach ulcers in just one 30 day once-off treatment! Matula Tea has been scientifically “in-vitro” laboratory tested and is over 98% effective! The 5 ways Matula Tea can help you to regain your good health! 100% natural product – NO negative side effects. Scientifically “in-vitro” laboratory tested to eradicate all strains of Helicobacter Pylori. Easy to take – only one course of 60 sachets is required, 2 cups per day for 30 days. Known to alleviate the symptoms of ACID REFLUX and CANDIDA. Unlimited FREE support and advice to you, even after you are free from H. pylori. How do I prepare and take my Matula Herbal Tea? We assume that you have been tested positively for the presence of Helicobacter Pylori bacterial infection somewhere in your digestive tract and you now wish to eradicate this bacteria by a 30 day treatment of Matula Herbal Tea. 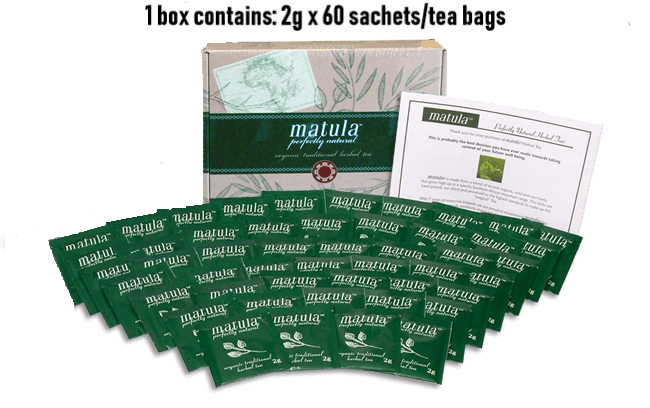 Your Matula Herbal Tea is individually packed in 2 gram (approx. 0.7 ounce) tea sachets and each sachet is sealed in an airtight multi-layer envelope. 1 box of Matula Herbal Tea comprises 60 tea sachets. To make the tea, please place one tea sachet in a tea cup or coffee mug. Pour between 100 and 150 ML (approx. 3.5 to 5 fluid ounces) rapidly boiling, good quality, water over the tea bag. Do not add sugar or milk. If desired, half a teaspoon of honey can be added. Let the tea draw for at least five minutes. Now drink the tea slowly in the morning ½ an hour before breakfast and at night ½ hour before dinner or at least 1 hour after dinner and swirl the tea in the mouth before swallowing. Repeat this procedure every day for 30 days- till all the tea has been taken and the treatment course completed. You should now feel much better and stomach pains should have disappeared or greatly diminished. If pain is still present, then that might indicate that the Helicobacter Pylori bacteria has not been totally eradicated from your digestive tract. In such case, it is imperative to retest for the presence of H.Pylori and this should be done by completing an H.P. Stool Antigen (HPSA) test, not less than 30 days ( max. 45 days) after the completion of the treatment course. Such test can be arranged by your medical practitioner. The Matula Tea formulation is comprised of premium quality ALL NATURAL wild and non-GMO herbs. It is conveniently packed, sealed and protected in a box with 60 sachets, sufficient for a 30 day supply. Matula Tea is comprised of a specific ratio of flowers, leaves, stems from six different plant species, some male and some female. Each of these plants are picked at different times during the four seasons of the year. Some are picked when budding, some when flowering, and others after seeding. Some plants can only be picked in the early morning, while others are picked in the late afternoon. The primary constituents of the formulation are a combination of finely ground dried flowers, stems and leaves, taken from the following species: Oleaceae, Asteraceae, Alliaceae, Fabaceae and Myrtaceae Click here for detailed description of the ingredients. *Matula DOES NOT CONTAIN any traces of wheat, caffeine, gluten, corn, soy, milk, egg sugar, colourants or preservatives, it is 100% ORGANIC! Laboratory “in-vitro” tests have shown that Matula Herbal Tea is totally nontoxic to humans (and indeed also to horses, dogs and cats). Test clearly show that it is even less toxic that the well-known and highly acclaimed Rooi Bos/Red Bush tea ( see test reports on website). We have now sold in excess of 20.000 treatment courses during a period of some 9 years and only now and again do we receive reports, that the tea has caused bloating and nausea. We believe this is caused by the release of toxins and dead H. Pylori bacteria from the digestive tract. We estimate this has happened to about 60 to 70 clients over the years ( less than 1/3 of a percent of total ). In such cases we normally recommend that the client stops the treatment for two or three days and then continue and this usually stops the problems. Click on Image to download your FREE E-book! CLICK image for your FREE E-book!